The Hummer H3 was the smallest and most recent of the Hummer range. Based on the same chassis ast the Chevrolet Colorado and GMC Canyon compact pickup trucks, the Hummer H3 shared absolutley nothing in common with the original Hummer H1 - which was basically a military vehicle dressed up in civilian clothes. 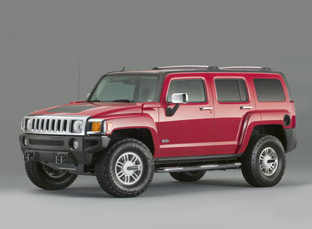 The Hummer H3 was was sold in two versions, a traditional midsize SUV and a midsize pickup known as the H3T. Powering the Hummer H3 was a 3.5 litre stright 5-cylinder engine which developed 220 horsepower and 225 lb/ft of torque. The Hummer H3 featured a two-speed, electronically controlled full-time four-wheel drive system that made it suitable for both on-road and off-road driving. The transmissions available included a standard 5-speed manual or an optional four-speed automatic.